If you’re in the market for a new video gaming system, you have an impressive number of options. It can be overwhelming, especially if you’re looking for a video game system that’s suitable for children. You want something that’s affordable, versatile, and will keep your kids entertained –– not to mention the need for a range of age-appropriate games. The expert team at GameTruck Atlanta plans mobile gaming parties for people of all ages, and these are our favorite video game systems that are kid-friendly. Not only does the Nintendo Switch have a range of titles for children, but the system also allows parents to set parental control restrictions. Kids may be tempted to stay up all night playing games like Mario Kart 8, but adults can set a shut-off time for the Switch. The Xbox One is famous for its mature game offerings like Call of Duty and Overwatch, but those aren’t the only games available. 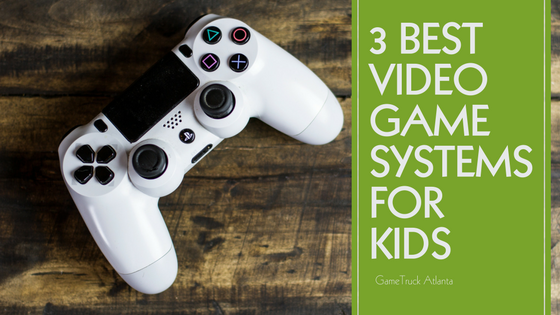 Whether you want to teach useful skills with a problem-solving game like LEGO Marvel Super Heroes or allow your children to get musical with Rock Band 4, the system has plenty of kid-friendly games that are even enjoyable for adults. The PlayStation system is one of Sony’s most established product lines, so it’s no surprise that the PlayStation 4 truly has something for everyone. PlayStation allows parents to set limits on which games can be played, whether a child has access to the Internet and whether the child can contact other player on the PlayStation network. And of course, the system also has a wide range of games for children of all ages. If you’re planning a party for kids, teenagers or adults, GameTruck Atlanta is here to help you make your event unforgettable. Our one-of-a-kind video game parties give you a way to entertain your guests without the stress of party planning. Contact us today at 866-253-3191 or click here for a pricing quote.